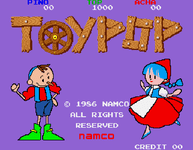 Toy Pop (トイポップ) is a multi-directional shooter arcade game that was released by Namco in 1986. The game was included in Namco Museum Vol.1. Toy Pop is a top-down multi-directional shooter that can be played both single-player or with two players simultaneously. The player ventures through 44 levels (Toy Pop uses the toy-themed term "Box" instead of "Level" to fit with the game's setting) collecting five gold hearts contained in jars in each level in order to advance. Along the way, the player must open gift-wrapped containers concealing weapons and score-increasing bonus items; these various weapons are used to defeat several different varieties of enemies, each of which are typically vulnerable to only one type of weapon. The back story is that two dolls, Pino and Acha, have gone into the castle of the witch Majyo, who has kidnapped their friends. The game's opening cutscene reads "PINO AND ACHA ARE GOING TO MAJYO'S CASTLE TO SAVE FRIEND" before gameplay begins. The story culminates with a battle against Majyo in the 44th level. Source: Wikipedia, "Toy Pop," available under the CC-BY-SA License.